I am currently using mostly PVC pipe for my laundry to landscape installations but am aware of the toxicity of the piping. I would love to become more ethical in my material use, and was wondering what alternatives there are to using PVC and other toxic plastics. And the alternatives seem either still like an oil product, mining product, and/or heavy/expensive. 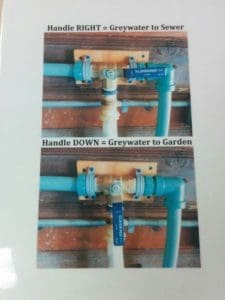 I understand alternatives may cost more, but I’m curious what people have done to avoid using products like PVC in their greywater installations. 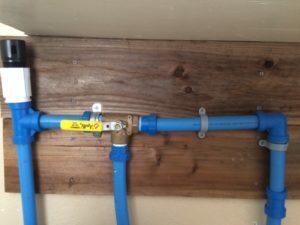 You can install a system out of HDPE (high density polyethylene) using products like BluLock or EcoLock. Here are two example images. The same products can be used in the landscape. They cost a bit more, but for a one-time install it’s not that significant. A larger irrigation store may carry the materials, or be able to order them for you. Home Depot sometimes carries EcoLock. If you go to either website (Hydrorain makes Blulock) they list their distributors and you can find a local store that way (or just call around). You can also order on-line from the larger irrigation stores (drip depot etc.) You don’t use glue- they use shark-bite fittings which push together. Thanks! How is the cost difference and attachment glue/material? Would I special order or find these at places like Home Depot/Ace?